Quotes from the book of Genesis. Cosmology relates to the layout, size, shape, origins, evolution, relationships, etc. of the earth, moon, sun, and the rest of the universe. The Bible -- particularly the Hebrew Scriptures (Old Testament) -- contains many references to cosmology. But there is no real consensus on how to interpret these passages. Historians, archaeologists, mainline and liberal theologians generally believe that the authors of books in the Bible simply accepted the contemporary Pagan beliefs taught in neighboring countries about the shape of the earth, and the layout of the universe. That involved a flat Earth with the Sun, Moon and Stars revolving around the Earth, More details. Many conservative Christians believe that God inspired the authors of the Bible to write inerrant, text. That is, writings that are totally free of error. Interpreting those biblical passages which discuss cosmology causes a problem, When the passages are interpreted literally, they conflict with scientific beliefs that have been in place for centuries. The latter describe an earth that is approximates a sphere in shape, around which the Moon revolves, with the Earth and Moon revolving around the Sun. The Sun, in turn, is located in one of the arms of a spiral galaxy composed of 100 to 400 billion stars. The Earth is very definitely not the center of the Solar System, the Milky Way, or the universe. Most Christians simply interpret the passages symbolically, and assume that they contain little or no scientific or theological content. They are largely ignored. Some conservative Christians -- particularly in ancient times -- interpret the passages literally and have believed in a flat Earth with the Sun, Moon, and stars revolving around it. He conceived of the shape of the earth as similar to one-half of a donut mould. He believed that there were two gigantic curved arms rooted at the North Pole, with the sun and moon attached to their ends. They obviously do not actually exist because explorers have visited the North Pole and found only ice sheets there. Note the squished shape of South America at the 5 o'clock position and the elongated version of Australia at 10 o'clock. which radically differ from actual land surveys. One wonders why the water from the North Atlantic Ocean in his version of the Earth did not drain into the bottom of the light-colored trench and submerge Australia and South Africa under water. 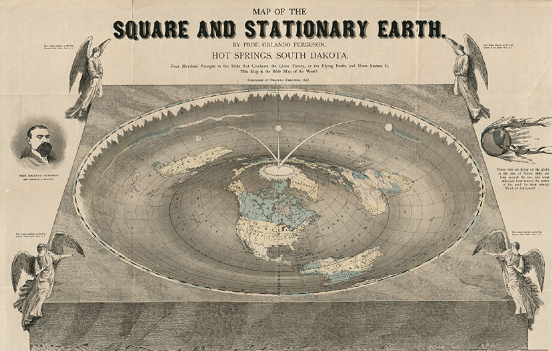 Like more modern versions of the flat Earth, he concluded that Antarctica was not a continent but was a thin layer of ice spread around the rim of the trench. The four angels in each corner of the Earth were inspired by Revelations 7:1 which talked about the angels holding back the four winds. One also wonders why the four angels did not slide off of the edge of the earth into oblivion. At the right hand side of the image, he drew a characture of two men flying on a spherical earth, desperately trying to hold on as the earth flew around the sun at 65,000 miles and hour. He included a listing of 400 Bible passages that he believed condemn the Globe Theory and/or a non-stationary Earth. The following quotations are taken from the King James Version of the Bible. It is not the easiest translation to read. However, it does help us avoid copyright problems. We will give only the literal interpretations of these passages. Genesis 1:6-8: "And God said, Let there be a firmament in the midst of the waters, and let it divide the waters from the waters. And God made the firmament, and divided the waters which were under the firmament from the waters which were above the firmament: and it was so. And God called the firmament Heaven. And the evening and the morning were the second day. And God said, Let the waters under the heaven be gathered together unto one place, and let the dry land appear: and it was so. And God called the dry land Earth; and the gathering together of the waters called he Seas..."
We are introduced to the cosmology of the ancient Hebrews at a point only six verses into the beginning of the first book in the Bible, Genesis. The term "firmament" meant a dome over the Earth supported by mountains around the edge of the Earth. Verses 7, 16, 21, 25,and 27 imply creation by action -- God physically made the world. This concept is more common among the neighboring Pagan cultures. This conflict may have been caused by the author(s) of Genesis combining two ancient Pagan stories into one biblical creation account. "A translucent dome, like an inverted basin, placed 'in the midst of the waters' defines the spatial boundaries of God's further work...The solid 'hammered-out' firmament restrains 'the waters' of chaos from above and receives its blue color from them. 'Heaven' is therefore the upper protected limit of created order." Genesis 1:9-10: "And God said, Let the waters under the heaven be gathered together unto one place, and let the dry land appear: and it was so. And God called the dry land Earth; and the gathering together of the waters called he Seas..."
Here, God is seen as dividing the flat earth under the translucent dome into dry land and oceans -- probably by raising mountains. Genesis 7:11-12: "...all the fountains of the great deep broken up, and the windows of heaven were opened. And the rain was upon the earth forty days and forty nights." This is a passage from the story of the great world-wide flood of Noah. It seems to have been derived from an earlier Pagan Babylonian myth of a great flood. The cosmological view of the ancient Hebrews involved a vault or firmament over the earth which contained floodgates. The latter were doors that could be opened from above. Water could be poured through the doors down to the earth as rain or snow. The Babylonian flood myth may well have been based on memories of a a catastrophic deluge when a land bridge was breached and the Mediterranean Sea flooded what is now the Black Sea about 7,500 years ago. Genesis 8:2: "The fountains also of the deep and the windows of heaven were stopped, and the rain from heaven was restrained." The author(s) of Genesis believed that the floodgates were physically closed, the rain stopped and the flood gradually drained away. Genesis 11:4-9: "And they said, Go to, let us build us a city and a tower, whose top may reach unto heaven; and let us make us a name, lest we be scattered abroad upon the face of the whole earth. And the LORD came down to see the city and the tower, which the children of men builded. And the LORD said, Behold, the people is one, and they have all one language; and this they begin to do: and now nothing will be restrained from them, which they have imagined to do. Go to, let us go down, and there confound their language, that they may not understand one another's speech. So the LORD scattered them abroad from thence upon the face of all the earth: and they left off to build the city. Therefore is the name of it called Babel; because the LORD did there confound the language of all the earth: and from thence did the LORD scatter them abroad upon the face of all the earth." A later text (3 Baruch 3:7) describes how the Tower was eventually built. The builders reached the underside of the sky and attempted to pierce through the metal surface with an auger. 3 The story appears to have been produced by the merger of two earlier myths: one involved the building of a tower to gain fame; the other involved the building of a city to preserve the unity of humanity. This topic continues with additional biblical quotations.